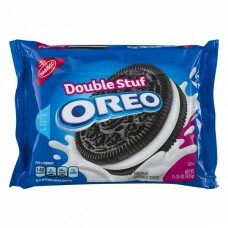 Nabisco Oreo Double Stuf Chocolate Sandwich Cookies. Per 2 cookies. 140 calories. 2g sat fat, 10% DV. 90mg sodium, 4% DV. 13g sugars. Slit appears when opened. Produced with genetic engineering. Mondelez International. With looks like these, you can't help but do a double take. 1-800-622-4726. Visit us at: oreo.com. ©Mondelez International Group.